In this interview Mrs. Leonardo Estrada (Delores Vasquez) discusses her early childhood in Mexico during the Mexican Revolution, her teenage years and marriage in San Francisco,CA, and her very large family of 15 children and over 50 grandchildren. 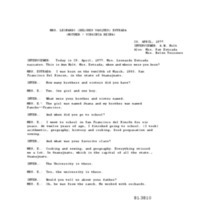 The transcript has been translated to English. Newton Public Library, Newton Kansas, “Delores Vasques Interview,” Digital Newton, Kansas, accessed April 22, 2019, https://newton.digitalsckls.info/item/764. narrates. This is Ann Holt. Mrs. Estrada, when and where were you born? Francisco Del Rincon, in the state of Guanajuato. MRS. E.:	Two. One girl and one boy. INTER. :	What were your brother and sister named. INTER. :	And when did you go to school? years. At twelve years of age, I finished going to school. (I took) arithmetic, geography, history and cooking, food preparation and sewing. INTER. :	And what was your favorite class? INTER. :	The University is there. MRS. E.:	Yes, the university is there. INTER. :	Would you tell us about your father? MRS. E.:	Oh, he was from the ranch. He worked with orchards. INTER. :	And the orchards, there were three? and it took six hours to irrigate the orchards. INTER. :	What did your mother do? had a Singer sewing machine and she sewed dresses, blouses, everything that they requested her to make. She was a seamstress. INTER. :	Oh, she still lives in San Francisco del Rincon. was building the orchards, where the ranch is. went to a ravine, there at San Francisco. They carried all the bodies in a cart of the city. Yes. INTER. :	When did you marry? Estrada. My father-in-law went to my father, in the same year that we married, for us^ and started with us from there for Newton. And here we are, still here. My father-in-law died in 1930. We left for San Francisco del Rincon, in the native land of his also, and we returned the same year of 1930.
had gone to the town square with a woman and her daughter. I had left with her. I was carrying corn that my mother had loaded me with, and when they all entered shooting, then we ran and I was throwing all the corn from fright and crying and vomiting, much terror. It was the worst scare I ever had in my life. I think I was ten years old. Yes. States at ten years of age. He came with other people and he would give water to the labelers. It was his work that they gave him because he was so young when he came, yes. Well, nothing but these scares when they entered and they fired shots in the plaza at times, when we were buying something, and there were scares, so that we ran and hid ourselves. INTER. :	What was Newton like when you arrived here? MRS. E.: It was pretty and I did like it because there were some good friends of my father-in-law, and that is where we arrived when we came from Mexico to their place. And they really treated us very well, but I had, it grieved me to be here and to leave my mother and my sister in San Francisco. Yes. But she also came herself after we had come here. She came with my sister. She arrived here, here at my place in 1921. My brother left for Kansas Bluff [Iowa] and that is when he came for my mother who was with us here in Newton. And he carried them to Kansas Bluff. He went there with his family, and he had come with his wife. INTER. :	When did your first child arrive? my daughters. And in ’28	in '29, another of my girls was born. Yes. And in'30, another girl was born. INTER. :	What are their names? MRS. E.:	Oh the first was named Dionisia. The second, Claudia. another male child Francisco. And in '35 another girl was born, whom we named Jennie. And in '37, another boy, was born, who was Pedro. And in 39, another girl, who is Josefina. And in ’42, Salvador, another male child, was born. Yes. And in '43, the youngest was born, Lorenzo. Yes. Did I not say the name of Salvador? died, they are fifteen in number. And twelve are still living. Because three of my girls, the female children, were the ones who died. And seven girls are living right now. And this year, the one born in '20 is going to be 57. She is the oldest. grandchildren and fifty five great grandchildren. MRS. E.:	Thank you very much. INTER. :	And can you tell me something of their childhoods? INTER. :	One must have a sense of humor! permit me to rear my children, and God granted me the permission. INTER. :	What did your husband do? MRS. E.: Oh, he worked on the Santa Fe. He says that in ’19 when we arrived he entered the Santa Fe, the Roundhouse. But now there is no Roundhouse--it is the Santa Fe. But they always went on cleaning the trains. It was their work to clean the trains. INTER. :	And did the trains arrive on time? MRS. E.:	Yes, yes, they arrived on time. less, was the salary that he earned? working, but still in ’39, they gave him very little in the check. at two years, one year and a half before he died, was when he stopped working, because he was sick. He began in ’19 until ’58. Yes, because he died in ’59. He had cancer of the lungs. and already on the street where we used to live, but it was another house, on another that is in front. But they were all good to us. Because, well, at the time, there were houses that they rented out to Mexicans with families. And because of that, there were Mexicans there close to us. INTER. :	What were the names of some of them? MRS. E.:	Oh, what is the name of the husband... Abrahan Rodriguez. BELEN TERRONES:	The Reyes were here then? two houses on the other side of us. INTER. :	That is, Antonio Gomez. MRS. E.:	Yes, with his wife, who was Irene, Irene Gomez. INTER. :	Father Schaeffers, what was he like? to earlier, rented to Mexicans with families). Unhuh, yes. Two of my girls were baptized St. Mary's, in the church of St. Mary. Then the rest attained baptism at Our Lady of Guadalupe that we had, that they built on First Street. He (Schaeffers) was not with the church then. B.T. :	Do you remember? Three Mexican fathers	? Father MufToz. offer flowers, in the month of May, to Our Lady. It was the custom that they carry flowers to the Most Sacred Virgin. INTER. :	What type of flowers did they carry here? together at houses, buying them, but they did not give them away as gifts, because they were for Our Lady. MRS. E.:	There was everything that one could want to buy here. Yes. MRS. E.:	Yes. Beans, chilies, potatoes, noodles, flour and rice. Everything that had everything that one needed. Sancho peppers. INTER. :	It takes more imagination. the girls, some lambs that jump and games that they could play. Yes, also, and the tops for the boys. Yes. And they enjoyed themselves a lot. Yes. And I bought the girls dolls and small pieces of cloth that they bought that way from remnants they sold so that the girls could make dresses for the dolls. All went to school, all. INTER. :	And when was it that they were speaking English? purely Spanish. But they entered school and that is when they learned English. All my boys and girls know Spanish. of the twelfth day of December, that is the day of Our Lady of Guadalupe, the saint's day of the Virgin of Guadalupe. INTER. :	What was Mass like then? morning to sing "Happy Birthday" to Our Lady. B. T.:	Luz Porras. Do remember Luz Porras who was here then? MRS. E.:	Yes, Luz Porras. Avila. Cistos Avila. Arellano. couldn't make conversation with, yes, with the women who arrived of these Americans. INTER. :	And what did you do to combat this? interpret for me. When we went to the town to buy something that I needed, yes I needed to carry along someone who knew English. Ah yes. In order to be able to live with so many members in a family, one needed credit in the stores. And they gave us credit and we paid each payday, one part. And so we were making payments from payday to payday. I didn't think that I was going to have so much family. INTER. :	And also that Newton would be growing so large? Navy, and he is now living in Wichita, on the same work that he had in the Navy, with airplanes. Beech, unhuh, yes. He went into the Air Force. How do you say that (in Spanish)? Salvador. Wichita. The work of painting	artist. And now he is an artist. Four years of study in the college in Wichita. Newton? Was it very different? Did you have to get accustomed to the climate? MRS. E.:	Yes, it was much colder than right now. Much snow. INTER. :	Had you seen snow before coming here? hail and downpours, but also winds that arrived. Floods. Each year, at the time of the waters, that is, from the rains, there had been floods there in San Francisco. Also, there were other great scares that we endured. The water hit the houses, and one left the houses so as not to be there in the water. (She talks of her youngest son.) His four years also, Lorenzo (Larry), the youngest, his work is of dressing hair. How is that said? INTER. :	Things for the kitchen? to give them to finish them in school. They left school and worked. And Maria, yes, she graduated. And Joaquin didn’t finish school. Claudia arrived to the tenth grade, and Joaquin to the eleventh. work in the hospital as a nurse (Bethel). INTER. :	Were there many teachers who knew Spanish in the schools? She meant to say Miss Kannapel (Catherine Westerhaus), she later explained. who was going to help me in ‘37, to take care of me. Who went to clean me everyday. That was born my boy, Pedro. Yes. She helped me with Pedro, with Josefina. Now with Salvador and Lorenzo, I went to the hospital, because then the doctors did not leave to go to the houses. Yes. At- first, yes, they left to the homes. Yes. That was Nicha, Claudia, Marfa, Margarita, and Joaquin. There were men who knew about midwifery, yeah, those who came to take care of me to see me when my girls were born. Of the rest, then the doctor came--of Pedro and Pancho (nickname of Francisco) and Salvador. It was Dr. Grove. He is still living. With Lorenzo, I had to go to the hospital because doctors didn't make house calls. And my doctor, the doctor of them then of Lorenzo and Salvador was Smith. them when they were born. Salvador weighed seven pounds and a half and Lorenzo, the littlest of the family, weighed nine and a half pounds. And before that, they didn't know how much they weighed. They alleviated me at home. --to leave for the outside to urinate, there at the ranch. [He began to yell or cry, scared, and it was that he looked towards the orchard, but in the dark the eyes shone. Yes and he thought it was the devil and then he went inside and cried and cried and when my father got up from sleeping, he sat one of us down on each leg and he began us praying. And we remained [until] asleep. Those were the frights that I carried. Because of this, I didn't want to be at the orchard. I attended more with my dear little grandmother. My mother's mother. INTER. :	What did your grandmother do? fathers of the church. It was her work. There wasn't any corn then that-there just wasn't any, then at that time. She, what they gave her when she left from work there, of the church for us to eat. The little (bocad ? tos) sandwiches that they gave her. I never went to mass without praying when I saw all the children in the arms of the virgins that were around the church-all the children that they had in their arms. My godmother told me that it was because I was going to have so much family. Yeah (in English). Yes. demands it of us, what are we going to do?" MRS. E.:	My children have their saint every month of the year. and that they have good thoughts and that they be good, and do good unto everyone. No, but it was he who looked after Joaqim (in Walton). And he worked there with him when he began to work there on the track (railroad). Seventeen years old. Mexican-American men. Was a mayordomo. she explained). daughter-in-law had told me.] Vasques is from the French. MRS. E.:	I believe they came to Mexico many years before I was born. For that reason I have only heard conversations that the French had gone. INTER. :	Ancestors. One of them was French.